Portrait of a Murderer was first published in 1933. 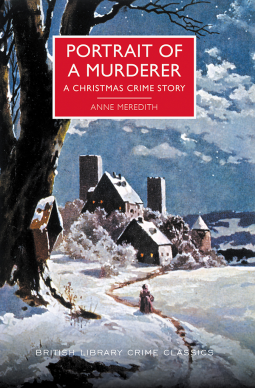 Anne Meredith is one of the pen names used by Lucy Beatrice Malleson (her other pen names are Anthony Gilbert and J Kilmeny Keith). This Poisoned Pen Press edition has an introduction by Martin Edwards. It is crime fiction where you know who the murderer is and the motive and how the victim was killed quite early on in the book. On Christmas Eve 1931 Adrian Gray was violently murdered by one of his six adult children. The murderer had acted on impulse in a fit of rage. Adrian had not got on with any of his children and they all wanted him to lend them or rather give them money for one reason or another. From then on it is a character study of the family and of the murderer in particular, who works out a plan to put the blame on one of the other family members. The setting at Christmas seems to be purely because this family don’t get on and it was only at Christmas that they gathered together at the Gray family home. It begins slowly and I was beginning to wonder if I wanted to finish the book, but I found I was thinking about it when I wasn’t reading and wondering whether the plan would work. As the suspense increased I realised that I was hooked and couldn’t wait to get back to the book to find out. Will the wrong person be convicted or will justice be done?It’s an excellent character study, told in the first person by the murderer and in the third person by the other characters. I was also fascinated by the picture Meredith paints of the society and culture of the 1930s. It’s set in the Depression and the Grays had come down in the world, no longer the owners of a large landed property. This was accompanied by a steady deterioration in character as their point of view changed and they aspired to possessions and a place in society with authority, consumed by jealousy and criticism of others.They are an unlikeable set of characters and probably one of the reasons this book works so well is that each one is described with precision and insight, so that they come across as recognisable people and not as caricatures. I also enjoyed reading about life in London in the 1930s, with descriptions of the River Thames, the traffic and the talk of electricity and speed, ‘the age’s God‘, and the desire for cars resulting in air pollution from the petrol fumes. The newly rich are financiers, such as Gray’s financial adviser and son-in-law, Eustace Moore. Although his appearance isn’t that of the traditional conception of a Jew, Meredith reveals the casual and nasty anti-semitism typical of the period in referring to his race. In addition she shows society’s attitude to women from the unmarried daughter expected to act as housekeeper and look after her father, to the scandal attached to divorce. From a slow and unpromising start Portrait of a Murderer developed into a fascinating novel that I thoroughly enjoyed. I’m very glad you enjoyed this one, Margaret. Sometimes, those slow starts can draw you in without your even being aware of it. Or, at least, they sometimes do me. And I like the idea of a book that really shares the picture of life at a certain time and place. I like what you shared about this book and think I might try it. I will admit that I’ve limited my crime novel reading of that time period to Agatha Christie. It’s about time I branched out. I suspect my library will be acquiring this one before long. They usually pick up all the Poisoned Pen Press books. Added this one to my next Christmas reading list, Margaret! I have this one on the Black Hole that’s my Kindle. Pleased to hear it’s so interesting, will try to remember to read it in December.